Home Defense Max Indoor & Perimeter Insect Control is an effective way to kill bugs and prevent them from coming into your home. Home Defense is now available with a Continous Spray Wand applicator. Use the new Wand for easy perimeter application. This creates a bug killing barrier. Extended reach, comfort Wand eliminates hand fatigue and bending over. Stop marching ants in their tracks with the Ortho Ant B Gon Max Ant Eliminator. Specially formulated to kill these small but mighty pests, this product comes in 2 convenient, ready-to-use formats, including a new 4L jug with Wand Applicator, that's perfect for larger infestations. Give ants their marching orders with new Ortho Ant B Gon Ant Killer Bait. Simply snap open the traps and let the pre-loaded active liquid ingredients work their magic on that pesky colony and its queen. These premium traps can be used both inside and outside your home for effective pest control. Give ant colonies the boot and show roaches the door with Ortho Ant B Gon Ant and Roach Killer Gel. A new syringe format allows for precise application control so that you can zero in on problem areas with no fuss and no mess. Syringes come preloaded for ease-of-use and can be used indoors and out. 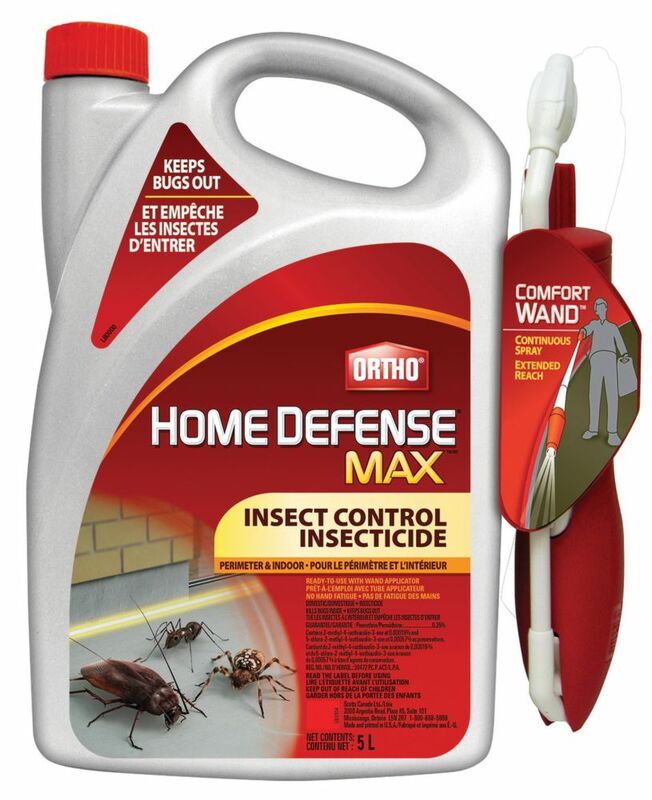 Home Defense MAX Perimeter / Indoor Insect Control 5 L Home Defense Max Indoor & Perimeter Insect Control is an effective way to kill bugs and prevent them from coming into your home. Home Defense is now available with a Continous Spray Wand applicator. Home Defense MAX Perimeter / Indoor Insect Control 5 L is rated 4.0 out of 5 by 3. Rated 5 out of 5 by dana from the best This product is very easy to use it comes with batteries installed. We used ortho home defense max 5l on our carpets we were infested with fleas i was getting bitten allot and we tried everything flea traps raid salt and borax steam cleaning, these methods only helped keep the infestation down. We saw the ad for the ortho and we tried it all the fleas are gone YES gone no more irritating fleas. Rated 3 out of 5 by Patelky from Why no refill? Stuff works great. But I need a refill without having to spend $39 for the spray pump. Any help out there? will it work against cluster flies trying to enter the house's through the sidings? Does it work on bed bugs? How many square feet will this 5L jug cover? I am trying to figure out how much product I might need for a commercial space. Can it be had in larger containers? Thank you for inquiring about Ortho Home Defense Max Perimeter and Indoor Insect Control. Unfortunately, this product does not control click beetles. If you have any further questions or would like further assistance, please contact us at 877-220-3089 and one of our representatives would be glad to assist you. Does this product kill carpenter ants and earwigs? Does this product work for house centipedes? Is this product safe to use when on a well and septic system?